Turmeric Tahini Dressing is a super healthy touch on salad bowls, grains and grilled vegetables. 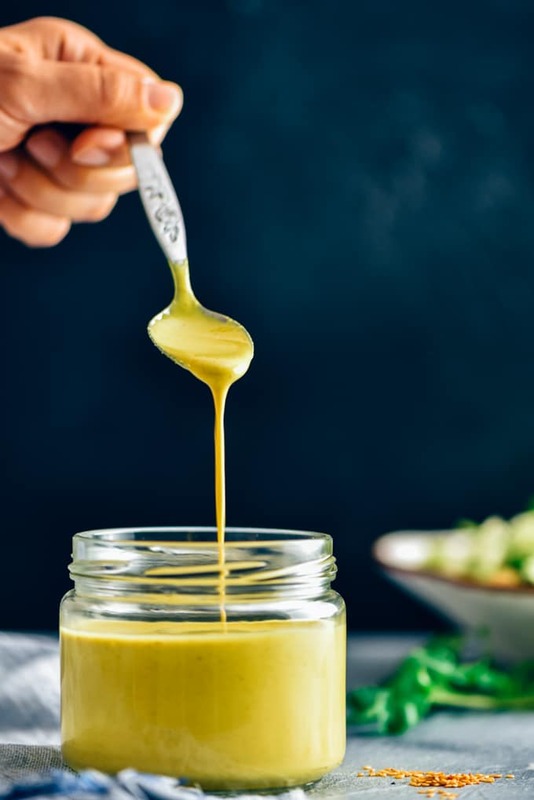 Wonderfully creamy and vibrant, this vegan tahini salad dressing with turmeric is so tasty that you’d like it as a dip too. I love to use tahini dressing on salads like Cold Lentil Salad, but I’ve been trying to use turmeric as much as I can in my recipes for a while due to its health benefits. 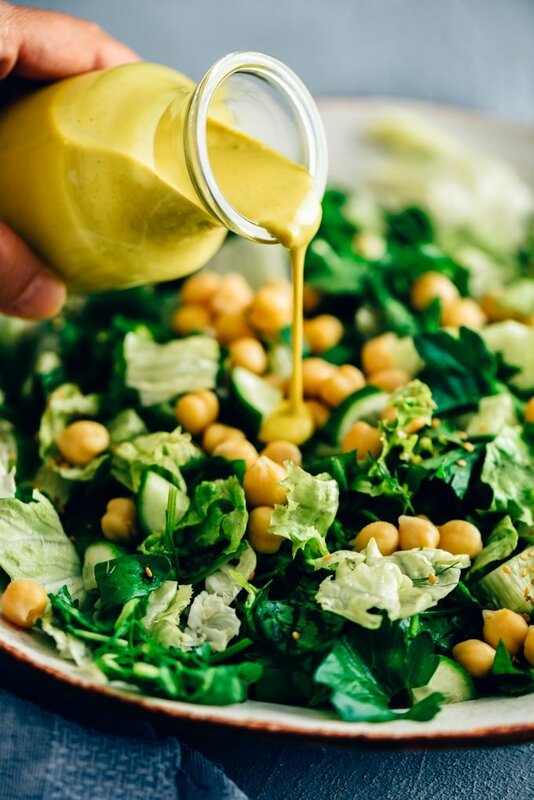 Combining it with tahini resulted in this amazing vibrant turmeric tahini dressing. How to make tahini dressing with turmeric? You need only 2 minute to make a batch of this dressing. Put tahini, lemon juice, salt, turmeric and water in a jar and shake until smooth. You can taste and adjust it to your taste. How much water to add depends on how runny you would like your dressing to be. Also if your tahini is runny enough, you can use less water. If it is thick, you might need to add extra water. On the other hand, if you are planning to use it as a dip, you might want to keep the sauce less runny, which means less water. I mean, the consistency definitely is up to your desire. You can even create your version by adding maple syrup, your favorite spices like chili or black pepper and garlic if you want a more flavorful dressing. Is this turmeric tahini salad dressing healthy? This is a healthy dressing recipe thanks to two great ingredients: turmeric and tahini. Turmeric is known as a strong antioxidant and an anti-inflammatory spice, which is also against cancer. As for tahini, it is made from ground sesame seeds, which are high in healthy fats. Also, tahini is good for skin health since sesame seeds are rich in amino acids as well. Is Turmeric Tahini Dressing Vegan? Yes, this is a vegan salad dressing that you can use over any vegan recipe from burgers to salad bowls or use it as a dip to serve with Veggie Kabobs. Tahini is such a great ingredient that you don’t miss any dairy products in this dressing. Although this recipe is vegan because we love it this way, you can add some Greek yogurt if you are not following a vegan diet and love the tangy flavor of yogurt in salad dressings. How long does this tahini dressing keep? Keep the dressing in a jar with an airtight lid in the fridge up to 5 days. It might get thicker as it is chilled, so bring it to room temperature and add a little water or olive oil before drizzling it over your salads. You don’t need this extra step if you are using it as a spread in burgers. Our suggestions to use with this tahini dressing are as follows. Although they are not completely vegan, they can easily be vaganized. You are aware of the health benefits of turmeric and look for more ways of including it to your diet? If you have a chance to make this Turmeric Tahini Dressing recipe, I’d love to hear your feedback. 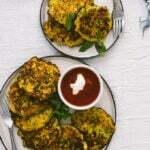 Please rate the recipe and leave a comment below. Turmeric tahini dressing is a healthy touch on your salads or in your burgers. Put all ingredients in a jar, cover with its lid and shake until combined well and smooth. If you don’t have a jar, put everything in a bowl and whisk well. You can keep it in an airtight jar or container in the fridge up to 5 days. Great to see my two favorite ingredients in a dressing. Thumbs up! Thanks Denny! Nobody in my family was expecting this dressing to be that tasty. Great way to include turmeric in our diet.